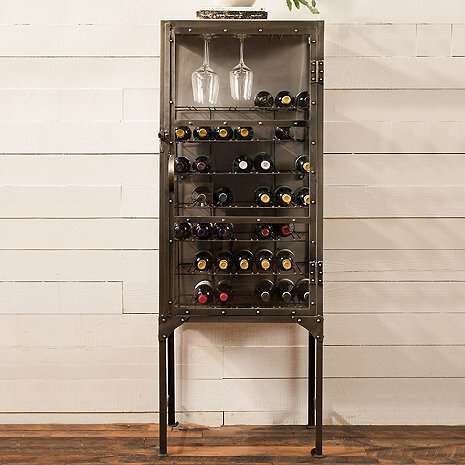 Inspired by industrial era strength, this sturdy iron cabinet is built to hold up to 49 bottles of wine. A convenient stemware rack is included above the top shelf. Perfect for a variety of settings, have wine and glassware conveniently at hand in your home’s den, lounge or living room. Crafted from age-old materials to last for years to come. Iron is finished in antique nickel. are the dimensions correct on this piece? it does not appear 63" W nor 15" H.
BEST ANSWER: The Hermitage Wine Storage Cabinet dimensions are as follows: 24 inches wide by 15 inches deep by 63 inches high. Can a lock be added to ensure no access?